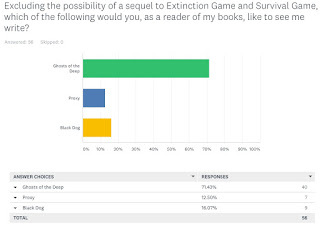 A couple of weeks back I posted a poll in which I asked people to pick which future writing project of mine sounded promising based on a one- or two-line description so I could try and gauge what kind of book people might like to see from me. I think anyone could have guessed what the results might be, but I still hoped for a surprise. I've been meaning to post about the results for a while now. I would have done so sooner, but I got caught up in writing a new manuscript - which I talk about further down the page. That’s just about finished, so now I think I can talk at last about the poll. I figured most of you would vote in favour of the description that most resembled the kind of books I’m known for, so of course it’s no big surprise that it came out well ahead of the others. Although I was perhaps a little surprised at how far ahead. And there was another unexpected result related to the two other choices I gave you. Here's a screen grab to show you what those results actually look like. As you can see, the vast majority of you are overwhelmingly in favour of Ghosts of the Deep, which I described as far-future hard sf. The other two contenders, Proxy and Black Dog are, by comparison, a long way behind. But the poll demonstrates they do have their supporters, however lightly sketched the description of each is. I was certainly surprised that Black Dog, which I described as Seventies-set Lovecraft, scored higher than Proxy, given Proxy is, ostensibly, cyberpunk. Of course, I didn’t actually use the word cyberpunk in the survey, and maybe that was a mistake. Maybe it's time to talk a little more about these ideas, and how far they've been developed. Of the three, Proxy is by far the most thoroughly developed. It currently exists as a detailed six-thousand word outline, and it got an enthusiastic response from my editor when I was still with Tor UK. Unlike the majority of my previous books, Proxy is set only thirty years in the future, and revolves around post-human mind-swapping in the criminal underworld of near-future New York. Black Dog, by complete contrast, is intended to be full-on horror fantasy, depicting the rise to prominence of a thug-like band manager in the late sixties and early seventies with a great deal of black magic and occult goings-on. Think Valley of the Dolls by way of The Song Remains the Same and Phantom of the Paradise. So, yeah. A long way from Stealing Light. But of course, the idea of doing something so utterly unlike anything I’d ever done before is what makes it so enormously appealing. And, like many of you, I’m sure, I’ve read a shedload of Lovecraft, as well as fiction that makes use of the whole Cthulhu Mythos. So it's natural I might want to write something like that. Both Black Dog and Ghosts of the Deep, however, are only lightly sketched-in by comparison to Proxy. Even so, this poll is a really useful reminder both of where my strengths lie, and therefore of what I should focus on. But neither do I want to get stuck in a rut of always writing books that use broadly the same settings and themes. A way out of that is to write more, and more varied stuff. And, indeed, the writing project that took up much of my time this month was a deliberate attempt to see if I could write a first draft of a novel in less than a month. As it turns out, I can. Therefore if I can write more, and faster, then I can hopefully produce a greater variety of books - not just the ones people want and expect from me, but ones that let me flex my creative muscles. It’s equally possible that some of the ideas I've talked about here could be novellas rather than novels since, after all, they take much less time to write. The other big takeaway from the poll for me is that running an occasional poll is not only fun, but genuinely insightful. Sure, sometimes the results aren’t always that surprising. But at the very least it's a direct link from your brain(s) to mine, and that's pretty useful.